In the late 1940's Jim's father spent several years exploring and traveling in the Arctic. This vast and intriguing land captured Bud Helmericks' heart, especially the beauty and diversity of the Colville River Delta. With his wife Martha and son Jim, Bud began carving out a home and livelihood on the edge of the Arctic Ocean, far from the normal vestiges of civilization. It is a harsh yet wondrous land of great beauty and contrasts: severe winters and amazingly productive summers when great numbers of birds, fish, and other wildlife mass for their reproductive cycles. By the early 1950's, a commercial fishing operation was well established in the delta to catch several species of whitefish and supply northern Alaska villages. Big-game guiding, an air taxi, and environmental consulting work were added to the Helmericks' ventures, all of which complimented Bud's numerous books and articles about the Arctic. The Last Of the Bush Pilots (written by Harmon Helmericks) is one of Bud's books about Alaska's flying frontiersmen and its author is himself one of the most famous of that adventuresome breed. Anachlik Island, located on the north-east side of the Colville delta, became the family homesite. Established in the mid-1950's, dwellings were only tents surrounded by snow blocks in the earliest days. Then in 1958 the first modern home was constructed from materials flown in aboard 13 air-cargo flights the year before. Bud and Martha Helmericks standing in front of C-46 cargo plane being unloaded on ice runway on Colville River. Previously, a small tractor had been purchased and shipped north on a cargo vessel to Barrow and then driven overland the 180 miles to the Colville to use for construction projects, including a runway on the frozen river ice. By plowing the snow off the ice, a long, smooth surface was made to accommodate the C-46 twin engine cargo plane flown north from Fairbanks. Over the years since that first building, numerous other buildings have been constructed, including hangers, warehouses, a barn, shops, and several more homes. Jim's two younger brothers, Mark and Jeff, plus others living here over the years, have added to the extensive family complex. Jim and Teena began building their current home in 1988, and this large structure seconds as the local lodge and also houses an extensive museum. In 1984 Teena wrote an article for the Prudhoe Bay Journal, a small newspaper for the greater Prudhoe Bay area at the time, and this article gives a good summary of Jim and Teena's family life in earlier days. What follows is an edited copy of that article. Have you ever wished you could live somewhere special or do something out of the ordinary? Well, my family and I do, and not because we deliberately set out to do so, but because we grew up doing so, and thought nothing of it. 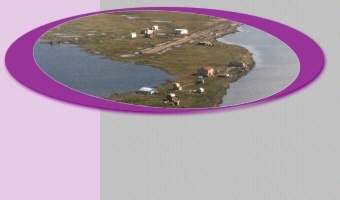 We live on a three-generation homesite on the northern coast of Alaska about 60 miles west of Prudhoe Bay. Colville Village, as we call it, sits on Anachlik Island on the outer edge of the Colville River Delta. My husband, Jim, is the oldest of three sons raised here in the Arctic. His parents, Bud and Martha Helmericks, settled in the Colville River Delta in the early 1950's when Jim was a small boy. They built up our present homesite beginning with nothing but a wall tent surrounded by snow blocks for their first home. Now there are modern two-story homes, a hanger for our planes, power and storage buildings, greenhouses, ice cellars, guest quarters and many other improvements to make a self-sufficient community. The Helmericks Homesite became the family's base of operation for numerous endeavors. A commercial fishing operation was started to supply Barrow and other villages with fresh whitefish from the Colville River. A flourishing big-game guiding operation developed, and later an air taxi came into being because of the demand for the expert flying skills which both Bud and Jim possess. The Helmericks became involved in the explosion of the oil industry on the North Slope, providing consultation and advise about environmental protective measures and clean-up operations, and in guiding or instructing the newcomers on the best ways to operate and survive under arctic conditions. We have kept daily records over all the years of weather conditions, game seen, and important aspects of arctic life. These records have become a valuable source of information on our area of the arctic. I lived in Barrow during the 1950's when my father, Rev. William Wartes, was the Presbyterian missionary-pilot for the whole North Slope. My family and the Helmericks family became close friends during those years and Jim's and my father often flew their planes together over the vast stretches of the arctic. My early years in northern Alaska gave me a fortunate background and profound love for the Arctic so that when I married Jim and returned to the Helmericks homesite in 1970, I felt like I was returning home. It has been natural that Jim and I should continue in the work and lifestyle that we grew up with. We still carry on the commercial fishery, operate the air taxi, and guide sportsmen and other outdoor enthusiasts. We provide support services for many types of operations including the oil industry, scientists from around the world, and various government agencies. And now we are raising our own four sons in the tradition of these Arctic ways. Being born and raised in the Arctic, they know no other life, and even more so than their parents, they take their extraordinary life for granted. Both winter and summer alike, the outdoors becomes a fascinating playground for them. And like most children, summer is their favorite time of year, for school is out and they are free to roam at will. Yes, even here on the edge of the Arctic Ocean, school can't be shirked. Mother becomes schoolteacher for half a day, six days a week. I teach the boys their lessons with a state provided correspondence program. Summer vacation becomes a blessed relief from the rigors of school for me as well as the children. Then there is time for many extra projects (work and play) that usually can't be fitted in during busy school days. Come September though, the books open again and off we go for another school year. Our son Derek, who is eleven, will be in the sixth grade this fall, eight year old Jay will be in fourth grade, five year old Isaac will be a first grader, and two year old Aaron is in perpetual mischief. Teaching the children at home by correspondence is not easy but has definite benefits. We are able to remain year-round at our long established home, keep the family together, and be in control of the quality of education and outside influences affecting our children. Although correspondence schooling is nothing new for many Alaskan families living in the "bush," it is certainly unique for the North Slope. I believe our family and others who have lived here with us are the only residents on the North Slope who permanently reside outside any established town. Thus correspondence schooling is the only way to provide our children's education, and still remain together as a family. Our home used to be considered isolated back when Barrow was the closest community about 165 miles to the west of us. But nowadays we have many neighbors. 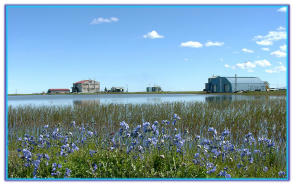 The village of Nuiqsut was established 22 miles upriver from us, and the many oil camps and rigs of the Kuparuk Oil Field are 10-18 miles east of us. We have often had seismic camps working all around us during the winter months. The twinkle of lights can be seen all around during the dark days and civilization continues to creep closer each year. It would hardly seem right to refer to our place as remote any longer. Our life is one of freedom and independence, but just as in any pioneer lifestyle, there is no end to the hard work and challenges to be faced. Our lives are much easier than our parent's lives were in the early days here on the Colville, yet there is still much to be done the hard way, especially during the harsh winter months. We heat our spacious home with wood and this means many hours a week of gathering and cutting wood for the stove. Much of the wood we burn is drift willow that Jim digs out from under snow along the river banks and then hauls home by snowmachine and sled. It takes several large loads of wood each week. Water-haul chores during the months when outdoor water lines remain frozen are always time and energy consuming. The water must be hauled from our nearby freshwater lake in large containers by snowmachine and sled, and then carried into the house with 5-gallon buckets and poured into our indoor holding tank. From here, a battery-operated water pump keeps the indoor water lines pressurized. I have drains that work all year, but the "honey bucket" must be dumped by hand in our local landfill. In the summer the water chores are lessened thanks to a windmill. It pumps water into a large holding tank atop one of the buildings and from there we have gravity flow water pressure to all the buildings. Electricity is only a temporary convenience. We have our own generators for our electrical needs, but due to the high fuel costs, this is a convenience we allow ourselves only periodically. It is used for such things as laundry day or charging the many batteries that run our radios, phone system, and other electrical equipment. (For instance, the children have a battery operated TV and computer for educational programs.) Besides, you can't imagine the peacefulness of true silence away from the racket of motors, generators, and other noisy equipment. We enjoy this true quietness most of the time. Just the mechanics of everyday life here can be a full-time job, yet there must be time for enjoying the land we live in also. Camping adventures or river excursions are favorite outings. We are all avid birders, so watching, studying, or just enjoying birds when they return to the arctic is another favorite pastime. (Then the arctic quietness becomes an arctic song.) Jim especially is an expert on all birds of the Arctic, for he has studied them for over 30 years. The children too have a rare knowledge of both birds and wildlife of the area, for they have lived and breathed them since babyhood. This fascination for Arctic wildlife has led us into developing an interesting and educational museum with many beautiful birds and animals mounted for display. We also have Arctic relics and artifacts and an elaborate collection of prehistoric animal bones, mammoth tusks, and fossil shells. These are always of special interest to any guests we have. One of the most unusual aspects of our life in the Arctic has been the small farm animals we have raised over the past 12 years. We have built a well insulated barn that has housed dairy goats, rabbits, laying hens, and various domestic ducks and geese. All of our birds and animals have wintered well in the barn and thrive outdoors on the Arctic prairie all summer. Fresh milk and eggs are an appreciated commodity. We can assuredly boast of having the furthest north small farm animals in the United States! Yes, we do realize that we live somewhere special and are doing something out of the ordinary. The whole Helmericks family has a lot to be proud of considering what has been accomplished over the years. There is a lot to show for the many years of hard work and dedication to this land and home of ours.